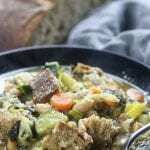 Ribollita - Italian Bread and Vegetable Soup is an authentic Tuscan meal. Made of cannellini beans, loads of veggies, day old bread and your favorite stock or broth. The soup is easy, healthy and perfectly hearty for chilly days. Heat a 5-6 quart dutch oven over med/high heat. Add oil and sauté onions until they begin to sweat. Add carrots, celery and potatoes. Continue sautéing another 7-10 mins or until veggies just begin to soften. Add garlic, herbs, tomato paste and broth. Bring to a boil, lower heat to a simmer and add in Swiss chard and kale. Simmer for a half hour stirring occasionally. Stir in savoy cabbage, zucchini and yellow squash. Transfer 1/2 cup of cannellini beans to a small bowl and smash with a fork. Add both whole and smashed beans to dutch oven. Bring back to a simmer for another 15 minutes. Meanwhile carefully cut or tear bread into smaller chunks. Stir into soup and let sit for 5-10 mins. Serve and garnish with a good quality parmesan.